The introduction of a new Spider-Man balloon to the 2009 Macy’s Thanksgiving Day Parade, brought back memories of the hero’s original inflated debut in 1987, the year of the Web-Slinger’s 25th anniversary. To celebrate the occasion, Marvel not only commissioned the balloon, but also an elaborate float, which would feature 14 characters, for which nine costumes would be created especially for the event. I'd been in parades before, but never in the Macy’s, the biggest parade in the world. 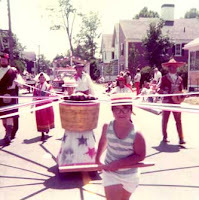 In Manchester, Massachusetts where my family summered when I was young, the town held a yearly Independence Day parade. To call it a modest parade would border on hyperbole. Its meager elements remained the same from year to year with slight variation: 2–3 high school bands from neighboring towns—the local high school didn’t have a marching band in those days—a dozen vehicles from the area antique automobile club; a Scottish bagpipe band from who knows where; various town selectmen and one or two politicos from larger nearby towns, garnering favor/votes; several antique bicycles, including an occasional bicycle built for two, ridden by people in period costume from—you guessed it—the area antique bicycle club; and a handful of floats. When I say “floats,” I use the loosest interpretation of the word. Nearly all were merely pickups or cars hauling flatbed trailers, representing various town businesses. Decoration was limited to a few hastily painted posters, some streamers and balloons, and on the more adventurous floats the representative business workers or owners would dress in their work garb. For example, the town landscaper’s float consisted of a flatbed covered in a swath of fake turf, sloppily contoured over a box, cement bag or something to give the effect of a hilly terrain, on which stood a worker holding a hoe and standing by a lawn mower. It was virtually the same every year; replace the hoe with a rake and voilà, you have the following year’s entry. There was one notable exception to the floats: the entries constructed by Pi Epsilon Sigma, a club comprised of the town’s Greek residents of which there were quite a few. Although not Greek by birth and not a full-time Manchester resident, my mother was christened Greek Orthodox prior to her marriage to my father—a full-blooded Greek—and a Manchester homeowner. Thus, she was a member. Not withstanding comparison to other floats—wherein a lemonade stand atop a truck accompanied by “Pop Goes the Weasel” on a Close-and-Play would have seemed awesome—Pi Ep’s entries were truly amazing. One of the club’s members was an architect/builder, who would design these elaborate creations. One year, the club built a replica of the Mayflower. I’m not talking a miniature model, constructed of balsa wood. I mean a large enough representation on which the members and their children, dressed as pilgrims, could stand and wave to the parade spectators as they passed by. The Trojan Horse Pi Ep built for another year’s entry may not have equaled the size and scope of the fabled article, but it was still several stories high and could comfortably hold a small battalion if not an entire army. 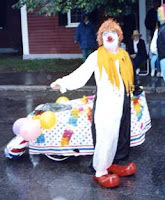 I was once fitted in a toga and rode on one such float. I didn’t do much—simply sat and waved—but it was exciting nonetheless. 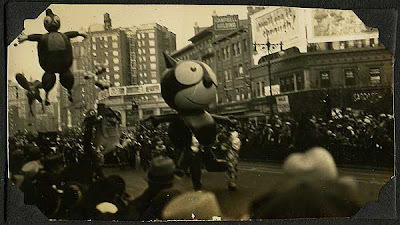 Although, it was bittersweet in that participating in the parade precluded any chance of scoring any confectionary swag thrown to the crowd by other floats. There was always at least one entry that hurled candy or bubblegum. Unfortunately, by the parade’s end, the candy inventory would be cleaned out, most times much sooner as over-exuberance and begging youngsters would get the better of these candy Koufaxes and they’d blow their load well shy of the finish. So there was no chance of running back along the parade route to get any leftovers. 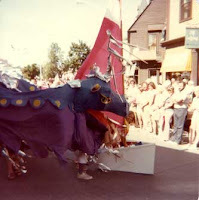 Contrary to what might be construed from the previous paragraphs, I loved these parades... and still do on the rare occasion when I visit the area over the Fourth of July weekend. There’s a sense of loving participation and pride that can only be felt from such a small-town event. And they were my first exposure to the electrifying effect of marching bands. 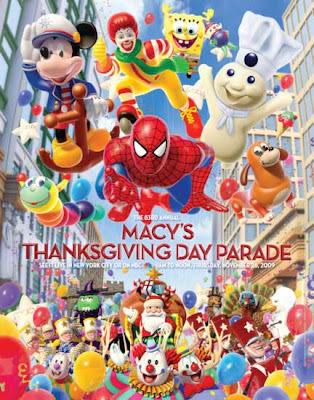 Of course, the granddaddy of all parades is the Annual Macy’s Thanksgiving Day Parade. To my young self, it was the highlight of Thanksgiving Day, not the turkey—which I never cared for—nor the football games, which never featured my team, the New England Patriots. In fact, other than the Macy’s Parade, I dreaded the day. Familial gatherings in my house were guaranteed to elicit a succession of fights—filled with screaming and crying—erupting from such innocuous things as the seating arrangement or one sibling’s receiving a larger slice of apple pie than another. My mother spent the whole day cooking and cleaning, awakening at the crack of dawn to put the turkey in the oven, and toiling until evening. She insisted on doing everything herself save for shelling the roasted chestnuts used in the stuffing, an unenviable task my grandmother dutifully performed. Unfailingly, at some point during the day, my sisters’ and my misbehavior and fighting would cause her to lose it. She’d call us ungrateful and swear that the following Thanksgiving we kids could fend for ourselves, all expressed in voluminous high-pitched tones using only the most colorful language. After punctuating her diatribe with “You can all just go to Hell!” she’d then return to the task at hand. It was a tension-filled day that even the time off from school couldn’t make palatable. The Macy’s Parade was the exception. Seemingly miles and miles of ginormous floats—some with moving parts and some with celebrities; marching bands with column after column of brass and drums; every clown in the known universe. And the balloons! 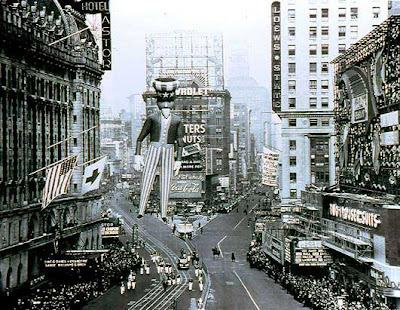 Giant balloons that threatened to swallow the surrounding buildings that fought to contain them: Bullwinkle; Cecil, the Sea Monster; Linus, the Lionhearted; Snoopy; Superman and my favorite, Underdog, whose clever design—arms outstretched before him, legs and cape behind—had him seemingly flying over Broadway. Sure, Superman was designed similarly, but I loved Underdog. When Barbara approached me about being in the parade, I was ecstatic, though I would’ve liked to have shared the experience with my belovèd Underdog, whose balloon was retired many years before. 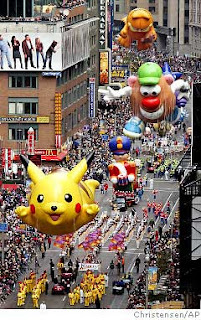 Ignorant me; I couldn’t—or maybe didn’t want to—comprehend why the balloons in the Macy’s Parade were retired. Why couldn’t they just fly the same ones every year or make new ones of the same characters? 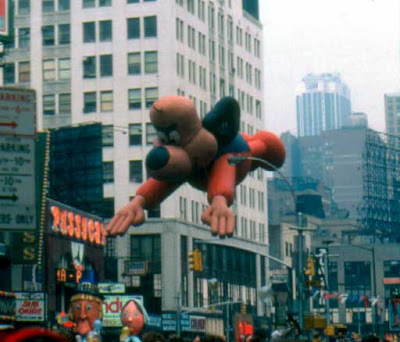 Who wouldn’t want to see Underdog flying through the skyscraper-lined thoroughfares of New York City each and every year? So what if the cartoon went off the air decades ago? Ah, the innocence of childhood nostalgia. I never realized that those Brobdingnagian inflatables only had a life-expectancy of seven years . . . nine at best. I don’t know why I never cottoned on to that fact . A garden-variety helium-filled balloon can always be found on the floor wrinkled, reduced and pathetic-looking the day after its arrival home. That’s a mere handful of hours compared to the estimated 84 hours over seven years of a Macy’s balloon (Inflation begins the night before and they remain filled until approximately noon the following day. And that doesn’t include test-flight time in the days leading up to the parade). This was years before the invention of mylar balloons, which never stop floating, and in so doing, have taken something away from the novelty of getting a helium-filled balloon. A fireworks display would eventually become mundane if unceasing. But to my young mind, the Macy’s balloons were not merely balloons, they were the gods of balloons, ever peering down at us lowly mortals. There was also the issue of financing the balloons. Macy’s didn’t pay for their construction. 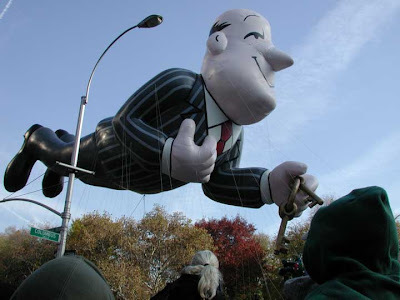 If a company wanted a balloon of their character in the parade, they had to pony up the money themselves; I vaguely remember $10,000 being the ballpark figure at the time I participated in my first parade in 1987. And that figure may have only been the participation fee, not the cost of design or construction. Macy’s designs all the balloons themselves—albeit with the help and approval of the respective clients—at the Hoboken warehouse, where they build new floats and store old ones that have yet to be retired. It’s certainly understandable that there would be a placement charge for returning floats and balloons. I also learned that having the money and desire to create a balloon did not necessitate Macy’s allowing it into their parade. Supposedly, Macy’s is extremely picky about whose characters they allow, although when you see such commercial properties as Hasbro’s Sky Dancer—a new toy the company was unveiling for Christmas the year of its debut and subsequently tanked—and Jeeves from AskJeeves.com, now simply Ask.com, it makes one wonder if Macy’s strict review isn’t influenced by piles of money. Yes, I’m well aware that all the balloons are properties promoting something, but c’mon . . . Sky Dancer?!! Jeeves?!! Why not have Amana sponsor a giant refrigerator? Or how about a balloon of Joe Camel, the RCA dog or NBC peacock? So both age and popularity play a role in whether a Macy’s balloon returns the following year. Needless to say, Sky Dancer was never seen again after her initial appearance. I understand Marvel’s participation wasn’t selfless, by any means. But Spider-Man was already an international pop cultural icon, twenty-five years strong. The company wasn’t using the parade appearance in an attempt to popularize the character the way Hasbro was hoping to do with their Sky Dancer toy. There wasn’t even an impending movie, cartoon or toy-line release that Marvel was using the Wall-Crawler’s balloon and character float to promote. Closer to the sad truth: the move was Marvel’s desperate cry to remind people that Spidey and his super-powered colleagues were alive and still kicking in the comics. My favorite parade--loved Underdog, too! Very amusing - loved the pic of Deano in the clown costume. Bagpipes warming up just beyond the backyard.....Bustah in the fiyahtruck....ending up in Anita's pool. Eternal Sunshine of the Spotless Mind. 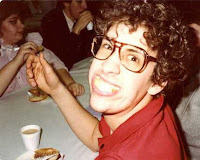 It was your Birthday Stevie? You're a big boy now! Ha-ha, seriously, I hope it was a good one. So are you going to write about how your Spider-Man experience at Macy's was like Arnold's as Turbo Man in "Jingle all the way" ? I Love a Parade, Part IV: I Scream, "FLOAT!!!" I Love a Parade, Part III: Isn't It Iron-ic?